Belmont sophomore running back Riley Christensen (4) breaks through line for a nice gain in Saturday’s 38–29 non-conference loss to North Crawford. POSTED August 24, 2018 3:52 p.m.
PLATTEVILLE — Grant Smith’s three touchdown receptions helped rally North Crawford from an early deficit, but it was his two interception returns for touchdowns in the fourth quarter that sealed the Trojans’ 38–29 victory over Belmont at the 2018 Six Rivers Football Jamboree on Saturday. Smith’s five-touchdown day was just too much for the Braves (0–1 overall) to overcome as they fell to the Trojans (1–0) in a hard-fought season opener on a hot and humid afternoon at UW–Platteville’s Ralph E. Davis Pioneer Stadium. Despite turning the ball over three times in a span of five and a half minutes early in the fourth quarter, the Braves were still in position to pull out a late come-from-behind victory when they took possession at their own 41-yard line with 2:33 trailing 32–29. However, Smith picked off a tipped Ethan James pass on the second play of the Braves’ ensuing drive at midfield and raced 54 yards to pay dirt to put the Trojans into a 38–29 lead with 1:52 remaining. Smith intercepted his fourth pass of the day just 17 seconds later, and then fellow senior Brent Jelinek swiped another James pass in the closing for the Trojans’ seventh turnover of the game to lock up the win. Smith and Jelinek were thorns in the Braves’ side all day long. “We have a lot of young guys were in positions to make plays throughout the game on both sides of the ball. 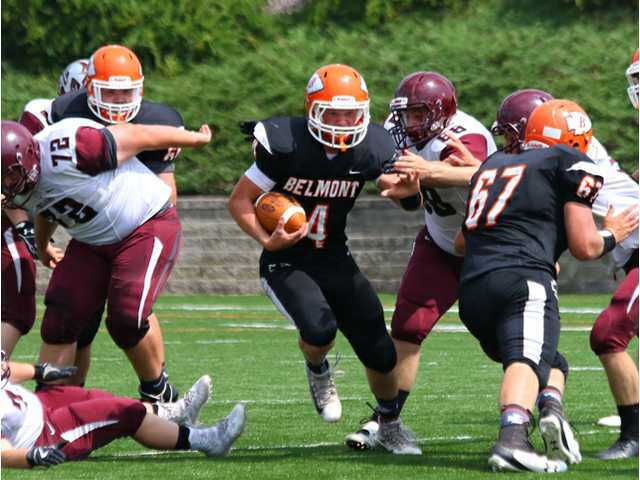 Now, we just have to make those plays,” said Belmont co-head coach Matt McKinley. Belmont took an early lead on their very first play from scrimmage when sophomore Riley Christensen busted loose for a 45-yard touchdown run to put the Braves up 6–0. The Trojans answered right back with a 30-yard TD pass from Jelinek to Smith to even the score at six all. Then, they grabbed a 12–6 lead on their next possession with Jelinek connecting with freshman Stephen Munson on a 43-yard scoring strike. Jelinek hooked up with Smith for a 20-yard TD with three seconds remaining in the first half to extend the Trojans’ advantage to 19–6 at the intermission. The Braves opened the second half with a nine-play, 63-yard scoring drive to trim the deficit to 19–14. James raced in from 23 yards out for the TD and he connected with Kolton Westemeier for the two-point conversion. The Trojans came right back with a 63-yard Jelinek-to-Smith bomb to go ahead 26–14, but the Braves answered just 14 seconds later with a 66-yard James-to-Christensen scoring strike to cut the gap back to five at 26–21 with 6:35 to play in the third quarter. The Braves used a goal line stand to get the ball back at the end of the third quarter, and they appeared headed back into the lead until a fumble at their own 17 stopped their momentum. The teams traded turnovers on three successive possessions midway through the fourth quarter with Smith returning his second pick of the game 22 yards for a TD with 5:50 remaining to give the Trojans a 32–21 cushion. After having a 57-yard TD pass from James to Christensen called back due to a penalty on the first play of their ensuing drive, the Braves shrugged off the miscue and scored three plays later on a 67-yard James-to-Will Cutler connection to cut the deficit back to five. Christensen tacked on a conversion run to make the score 32–29 with 4:35 to play. The Braves’ D forced a quick Trojan punt to get the ball back, but they had three interceptions over the final two minutes of play to thwart the comeback. Belmont outgained North Crawford, 432–377, for the game, including a 246–121 on the ground; however, the Braves hurt themselves with seven turnovers and 11 penalties. Christensen rushed for 168 yards and a score on 19 carries and added two catches for another 82 yards and a TD. Cutler hauled in three catches for 104 yards and a score, while James went 5-for-18 through the air for 186 yards and two TDs and he ran 12 times for 72 yards and a TD. A first victory will be on the line when the Braves return home to face Benton/Scales Mound in their Six Rivers Conference opener on Friday, Aug. 24. Kickoff is set for 7 p.m.
NEXT: The Zephyrs (0–1, 0–1) were defeated by Potosi/Cassville, 52–6, in their season opener last Friday. First downs — NC 17, B 16. Rushing — NC 37-121, B 34-246 . Passing (comp-att-int, yds) — NC 19-18-1, 256; B 5-19-5, 186. Fumbles–lost — NC 0-0, B: 2-2. Penalties-yards — NC 8-52, B: 11-58.